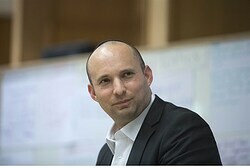 Minister of Economy Naftali Bennett, head of the Jewish Home party, has responded to United States President Barack Obama’s speech at the Saban Forum with a warning that Israel must maintain control of its own defense. “We got an ‘all clear’ yesterday, as if the agreement with Iran is a good thing, and we need to trust our friends to ‘watch our back,’” Bennett wrote on Facebook. Many Israeli leaders have been wary of promises of international protection, as international forces have largely failed at preventing terrorism in the past. The troops that took control of the Philadelphi Route between Gaza and Egypt for example failed to stop Hamas from smuggling in tens of thousands of rockets, which it used to attack Israeli towns. UNIFIL troops in southern Lebanon similarly failed to prevent Hezbollah from heavily arming itself prior to the Second Lebanon War, or from rearming in the years that followed. More recently, there have been rumors that Europe has threatened to withdraw its support from the international force there altogether. While Bennett expressed reluctance to rely on friends for Israel’s protection, he thanked those allies who have offered support in the face of Iran’s nuclear program, particularly new Australian Prime Minister Tony Abbott. “Abbott is a real friend to the state of Israel and the Jewish people, and has expressed tremendous willingness to act on behalf of Israel’s security,” Bennett said. In his speech at the Saban Forum, Obama said his envoy, General John Allen, had concluded that Israel’s “core” security needs could be protected even with the establishment of a Palestinian Authority-controlled Arab state in Judea and Samaria. United States Secretary of State John Kerry made similar statements regarding Allen’s plan. “Never before has the United States conducted such an in-depth analysis of Israel’s security requirements that arise from a two-state solution,” Kerry said.